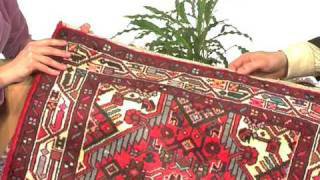 Information about Hamadan#Shahrbaf carpet from Persia / Iran. The Hamadan carpet is knotted in 500-600 villages in an area surrounding the city of Hamadan in northwestern Persia. Every village or smaller group of villages, has its own obvious distinctive character. The carpet is generally very colourful and made with good quality wool. To sum up, this carpet is worth its price and are good utility carpets. Shahrbaf is a carpet of higher quality.